Saute garlic in butter until soft (a few minutes) on medium. 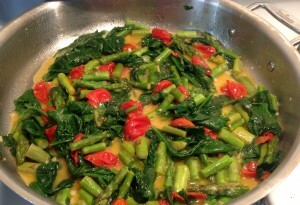 Add tomatoes and asparagus and cook for about 10 minutes or until softer, add spinach and cook for another 3 to 5 minutes. Salt and pepper. Use the extra sauce for your protein, it’s great on fish! Saute’ garlic in butter until soft (a few minutes) on medium. Add tomatoes and asparagus and cook for about 10 minutes or until softer, add spinach and cook for another 3 to 5 minutes. Salt and pepper. Use the extra sauce for your protein, it’s great on fish!